If you’re looking to build garden walls with reclaimed stone, dry wall stone, or any other garden stone wall, to define spaces in your garden areas, patios and lawns, a timeless stone wall is the solution. Landscaping with stone walls can create imaginative additions to your garden. 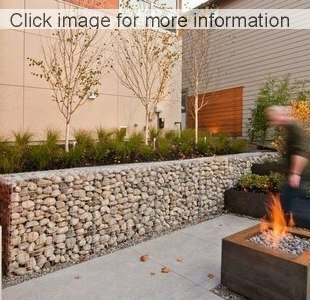 Below are some great garden stone wall ideas. 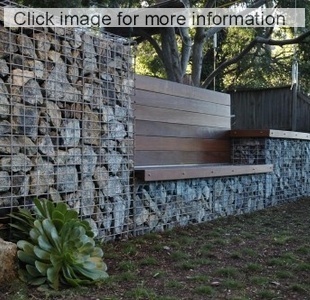 Gabion stone walls, can be carefully hand stacked to give a dry stone wall look, and by using reclaimed stone from around your garden, you can reduce the price of the stone walls. 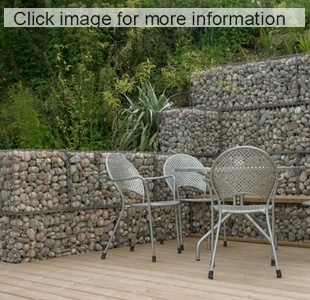 Natural stone walls, make excellent retaining walls in your garden. The colour of stone selected, whether it be sandstone, limestone, recycled concrete, or old bricks will make a feature of you garden wall. 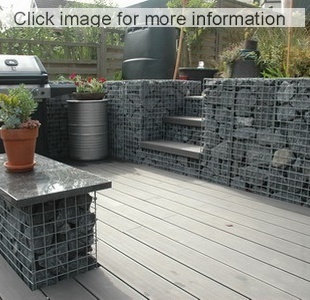 With the gabion baskets you are able to build low cost stone walls, of almost any size or shape, in most cases without expensive concrete foundations. 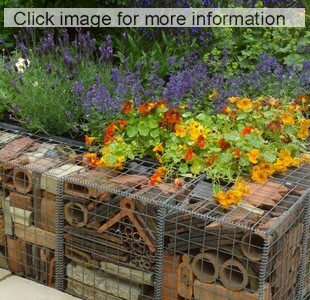 The garden stone wall system is delivered in flat pack kitset form. This dry stone wall, was built on an reinforced concrete footing. The stone walls strength relies on the steel reinforcing bars and concrete infill to support the stone. An engineer may be needed to specify the size and locations of the renforcing steel used in these stone walls, and will also specify the drainage system required behind the wall, which is critical to prevent hydrostatic pressure damaging the stone wall. 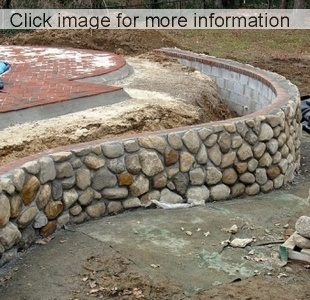 Small garden stone walls are stacked to form an attractive stone garden wall and are DIY friendly. The design of taller stone walls may require thicker stone blocks to be used at the base. 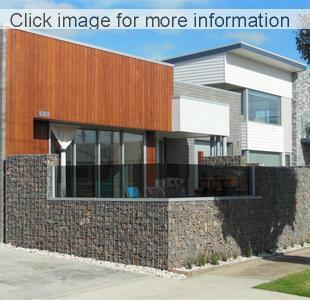 The rounded river stones are a decorative garden feature in front of this modern block wall. This wall requires no specail foundations. The architect has combined stone wall and paving to design a garden wall that is both structural and aesthetic. The stone veneer clads the concrete reinforced masonry block retaining wall. 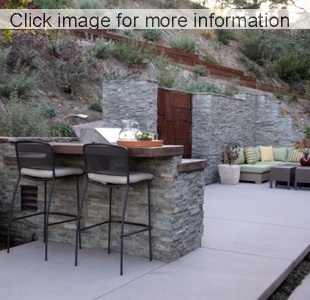 This wall has a barbeque, built in servery beside a water feature and makes the most of a steep sloping hillside. The designer has combined with the engineer to design wall that is both structural and creates a very usable flat patio space. The design of all stone wall foundations needs to consider, the soil profile, soil type, (clay, gravel or sand), the final height of the wall and any loadings from driveways and nearby buildings, that will increase the forces that the stone wall has to withstand. Site access, the look of the stone wall, material and labour costs are also factored into the final stone wall selected for any garden project. Tall narrow garden stone walls may require the foundation and support structures to be designed by a registered engineer, or suitably qualified person. The civil engineers stability calculations, site inspection and soil analysis are used to design the stone walls foundations. Home owners, weekend builders, and diy specialists can build garden stone walls depending on size over several weekends. 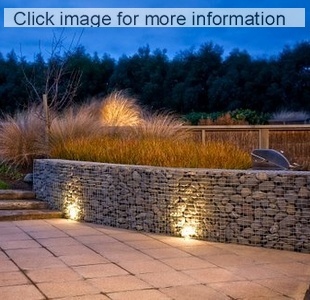 For larger garden walls you can get a quotes from, local landscapers, small earthworks contractors and specialist stone wall builders, who have both the machinery and experience to build the larger garden stone walls quickly for you.